Science Research students who presented at a Science Cafe from Newburgh Free Academy: Andrew Gomez, Stephanie Alvarado and Diana Ramos join WVHS students: Lauren Lepre, Pilar Paez, Erin Flannery, Annabel Field, Ava Ghobadian and Hannah Davis. 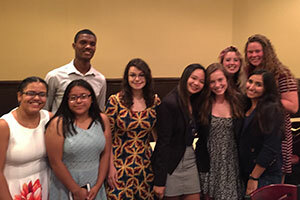 Warwick Valley High School Science Research students collaborated with students from the Newburgh Free Academy and presented their research at a summer Science Café in Newburgh. Science Cafés are lively events that take place in casual settings such as restaurants and coffee houses, are open to everyone and feature an engaging conversation with a scientist about a particular topic. 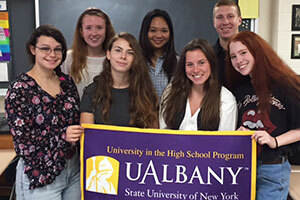 WVHS Science Research students who earned SUNY Albany credit last summer: Lauren Lepre, Lauren Fox, Sarah Benson, Pilar Paez, Erin Flannery, Brian Reiber and Danielle Goldbaum. Congratulations to WVHS Science Research students who also spent their summer earning SUNY Albany credit. Seven students worked on their research for a minimum of 90 hours to receive credit.